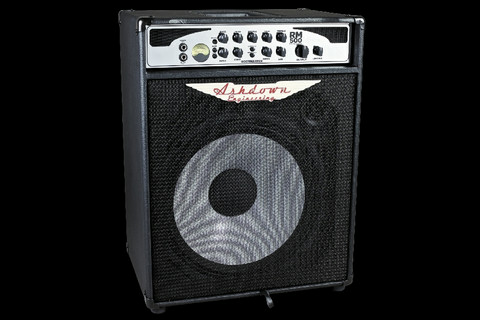 New to Ashdown&rsquo s streamlined range of combos is the Rootmaster EVO C115T 500 &ndash a powerful 500 watt combo, loaded with a single Ashdown White Line 15&rdquo speaker. Like other combos in the Ashdown Rootmaster line up, the C115T 500 offers improved features and finish, coupled with a dramatic reduction in weight. Tonally, the compact design maintains the low-end response with a more dynamic mid range. The addition of the tweeter provides extra high end and can be adjusted either to either hi, low or off depending on the player&rsquo s preference. The Rootmaster EVO series&rsquo pre amp now includes a passive and active input jack socket for use with high and low output instruments, this sets a clear signal path to the input control enabling you to fine tune your input level using the trademark Ashdown VU meter. With the signal at its optimal level, you then hit the rich features designed enhance your tone, such as the shape button, 5-band EQ and on-board compressor. The drive control, as always delivers a delectable valve emulated over-drive, whilst the sub harmonic controls add further fatness to your tone - both can be foot-switched via an FS 2 footswitch (sold separately). Rootmaster EVO combos also feature an upgraded power section plus a handy mute button. What&rsquo s even cooler is when switched to mute, the trademark Ashdown Engineering VU meter changes from orange to cool blue &ndash creating the perfect on stage mood lighting between sets. The Rootmaster EVO series&rsquo pre amp now includes a passive and active input jack socket for use with high and low output instruments. The five- band rotary tone controls act with surgical precision to provide total control over your sound, while a shape switch instantly dials you in to a classic Ashdown tone setting, straight from the world-famous ABM. If you want to use your favourite pedals or multi-effects, you&rsquo ll find send and return sockets on the back panel, along with a DI output for direct injection into the PA mixer or recording console and a Line Input (with front panel level control) so you can jam along with a backing track in rehearsal.